During the Civil War the Confederate troops in addition to the standardized ordnance guns also used all kinds of guns, including many sourced from European countries. Among the guns used to equip the Cavalry there were also the traditional hunting side by side shotguns with shortened barrels to be handier while riding a horse. In this way the Cavalry regiment acquired a noticeable advantage in the short distance battles. 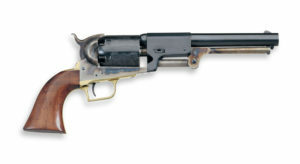 Many such guns with shortened barrels featured both main spring locks and the back action locks. The barrels were not always shortened. Their popularity in fact, induced many gunsmiths to produce guns with short barrels and a single trigger mechanism. This shotgun features a nice brown color for the barrel. The locks are case hardened. Spec: Weight 3 kg. Caliber 12 CYL. 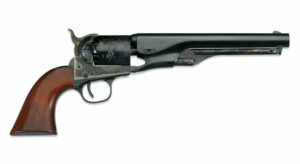 Barrel’s length 510 mm, overall length 925 mm.